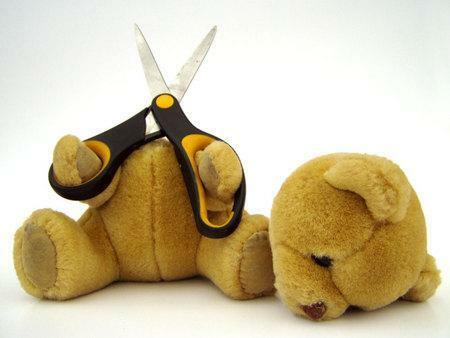 Should suicide be discouraged or enabled? I am a former police officer and work as a private investigator. I have been sued for speaking the truth on corruption. My marriage was attacked and all sorts of cruel legal tactics came into play. Things became so bad that at one stage I considered suicide and therefore believe that I am qualified. Legal tactics include attacking a person’s character and reputation , I considered myself as a strong person but the years erode your strength and you are repeatedly portrayed as a sinister being when in reality you are the opposite. I have often wondered how many people who are involved in litigation ae pushed over the edge , there are no apparent surveys done on this , no public money is made available. Yet for those who drown we have bucket loads of research and we actively strive to reduce the road toll and enforce all sorts of measure and throw tons of money at prevention. The annual road toll and he drownings are far smaller than the annual suicide rate. And let’s not forget that some of the figures in the road toll and drownings will be suicides . On the one hand our society is reckless with regards to suicide and encourages those who are healthy but stressed commit suicide because of the apparent lack of justice while those who have no hope of ever living a life without pain and suffering are denied this right due to lack of physical capacity. For the past 10 years I have studies the tactical methods which seek to bully and undermine good people involved in the judicial system part of this is giving them an appearance in the eyes of others to be sinister and when the court supports the opposition few will believe that this person is a victim of a screwed up justice system which relies on ancient protocols instead of evidence. If we were to interview the relatives and friends of a suicide victim I believe that a disproportionate number of incidents would show some kind of legal issue in the background. Our primitive justice system does not consider emotions and the civil jurisdiction does not have to comply with the rules of fairness like our criminal jurisdiction does. On the other hand those who live life without hope and lack the capacity to take their own life but have the mental capacity to know that future life is futile and will not improve must sit and wait till nature takes over. If you have a pet and bully and torment it so that it shys away from others and finds itself unworthy you could also face prosecution but these tactics are totally acceptable if the victim is a human. Amazingly such an approach will actually reduce our suicide rate by keeping healthy people alive and allowing those terminally ill the right to die . On the other hand we believe that the public sector is very corrupt but we are now getting more exposure on that which has previously been carefully concealed. Snively’s comment proves the short sighted focus of Transparency International New Zealand inc of keeping the corruption free appearance alive. We can only hope that Transparency International NZ is encouraging our government to take a hard line and enforce the law against those who are corrupt rather than pretend it is not happening. 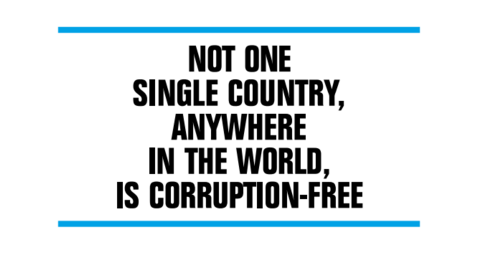 We support Transparency internationals statement that ” Not one single country anywhere in the world is corruption free ” so why does Susan Snively wish to give New Zealand the apparition of being corruption free? As an economist she apparently sees this as a good move for the economy. We see her efforts as encouraging the concealment of corruption there by making the country a very dangerous place to trade in . convince every one that there is no corruption by suing those who are whistle blowers or show any hint of exposing corruption . prosecute those who engage in corrupt practices so as to discourage others. From and economist point of view it is much cheaper to conceal corruption and in New Zealand transparency International NZ incorporated in our opinion appears to play a vital role in the concealment of corruption as its members include the very Public sector agencies whose performance is being rated. What does Transparency International – New Zealand Know about corruption ? Neil had a secret one which I had stumbled on and I had to be silenced at all costs. He had written legislation for his own business plan and as ” independent adviser to the select committee he ensured that this legislation became law. AWINZ became a law enforcement authority, because no one checked that it existed , it had powers that equaled those of the RNZSPCA search seizure . 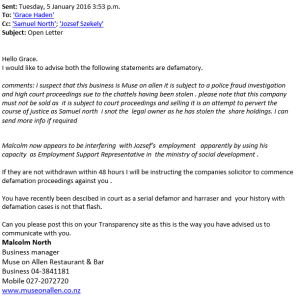 If an animal welfare prosecution eventuated Neil Wells performed in his capacity as barrister and would offer diversion for a donation to the “charity”AWINZ which in reality did not exist other than the bank account which he had opened and was the sole operator of. that was my first experience of civil litigation ,Neil has ensured that it would not be my last and has been stirring up any one who I mention on this site . 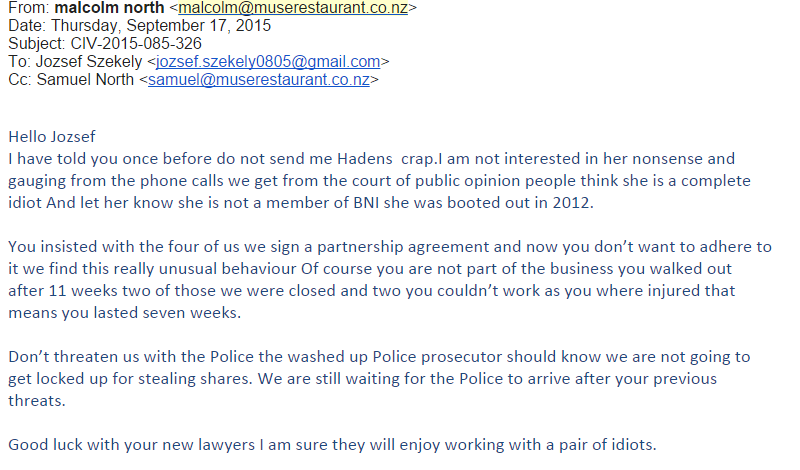 I was taken to court last year by the lawyers who represented Muse on Allen . Documents were filed which claimed that Jozsefs share holding had been removed in error . The lawyer representing he company did not like me telling him that if it was an error then the error should be corrected. I pointed out that when new annual reports are filed in the companies office then the error appears not to be an error. there have now been three annual returns filed since Jozsefs share holdings were claimed to have been transferred in error . 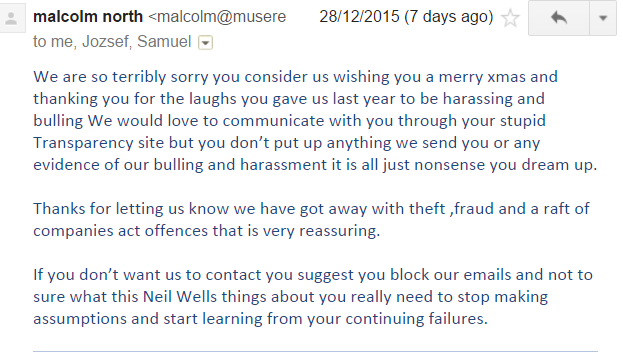 so the lawyers took me to court for harassment this is after having falsely accused me of contempt of court and blackmail . 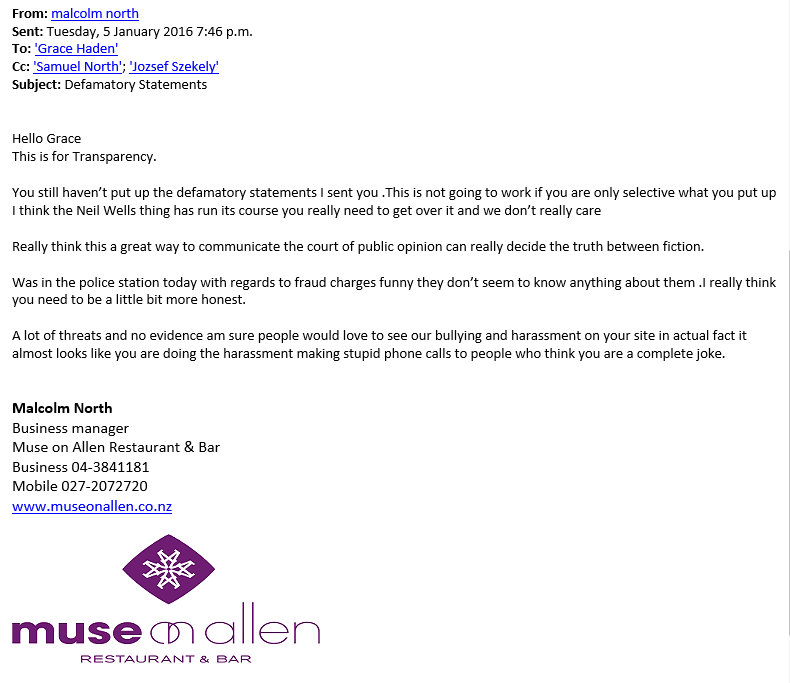 Apparently it is harassment to tell a lawyer that he should not be going round making false allegations and that he has a duty to be independent and act according to the rule of law. Documents were withheld from me including the court hearing date . When the papers were served there was an initial court date given as usual . the matter was was set down for hearing and I thought it strange that I had not been advised of the date but this often happens near the end of the year. I discovered the true date after a bit of game play by the lawyers and at 9 am on the morning of the hearing I was told that I had to appear at 10. slight problem the hearing was in Wellington and I live in Auckland . I was later to find out that there were other documents which the court had been given and which had conveniently not been served on me. These documents were submissions which alleged defamation of the lawyer . 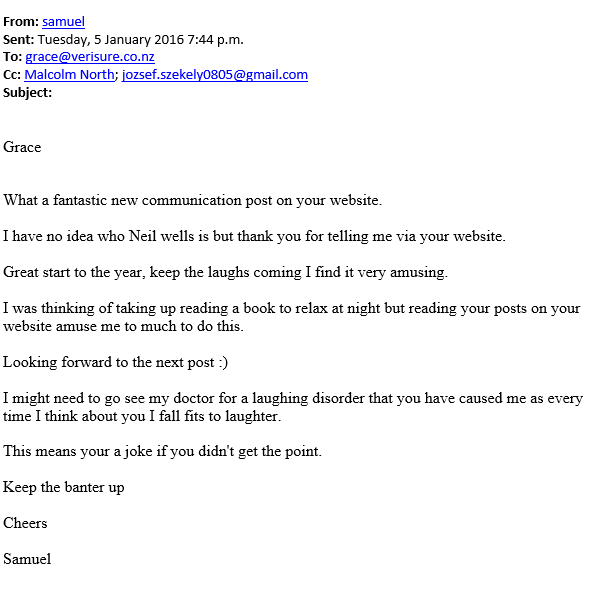 So without any legal defamation process and without any right to defend myself or even knowing that I had been accused of defamation, I became a serial defamer and harasser seething which Malcolm North now uses to spout on about to defame me . 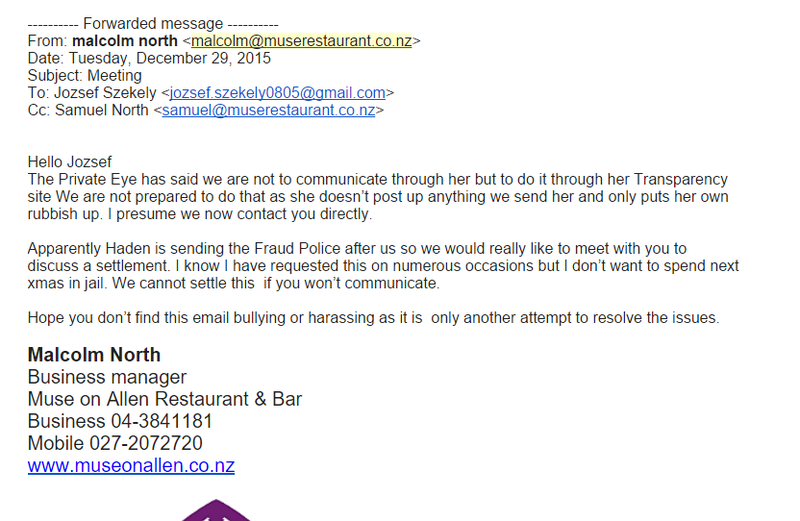 In the mean time his son who has claimed the restaurant as his own but has no equity in the place slings below the belt emails at me at christmas time telling me that I am hated and alleging that my former husband and children are among those and that I don’t have any family to enjoy christmas with . I know this not to be true and I resent a kid younger than my children bullying me in such a manner. 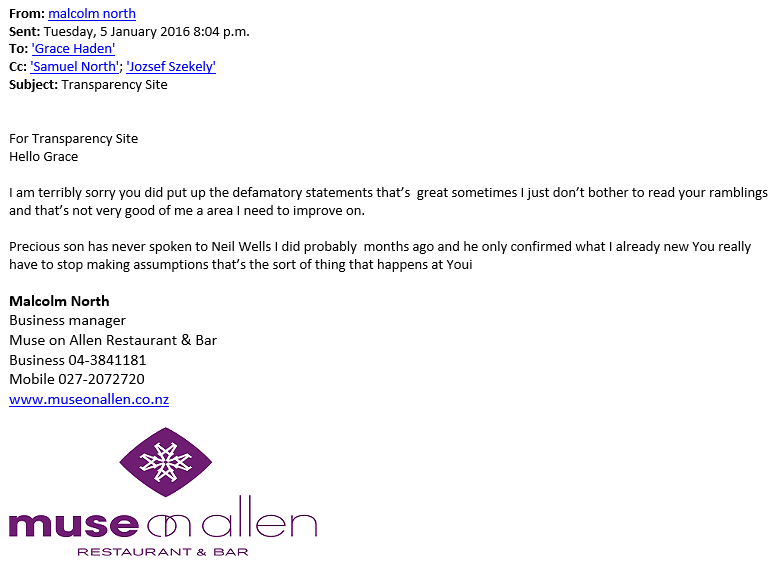 It turns out that Neil Wells has been in the back ground following my every move and prompting every one I have contact with to make such allegations. The same happened with my former lawyer who was stuck off last year. the court stepped in and with a confidentiality clause all was dealt with minute Judge Sargisson. I’m getting a little bit over this use of he court by criminals to attack those who have no ability to get the government to act on criminal matters. In this case the Registrar of companies appears to do nothing to control the use of companies and the police are too busy reducing the road toll but driving more people to suicide . So far the settlement offers have been a total insult. Is this the way of the future a criminal rips you off breaks a raft of laws then says hey I will give you two and tuppence halfpenny so that it can all go away . 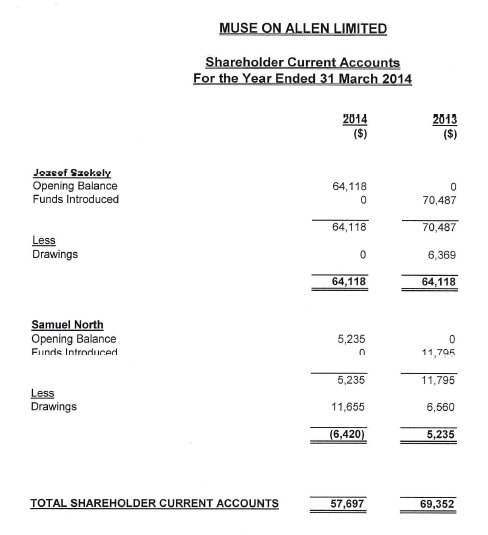 Malcolm could you please clarify how you can take action against Jozsef for being a 63.2% share holder yet not consult him in the sale of the business your own accounts show that he is the only person with equity in the business see here . Samuel who unlawfully transferred all of Jozsefs shares to himself acted with the consent of the other directors of which you are one. You are all in it together . will soon put up a post with Trevor Morely who asked them not to divulge that they had contact him if they are on about laughs I can provide some good ones. when some one calls some one a name it usually means they are looking in a mirror .We are just after justice and did not subscribe to this on going crap .